I had so much fun with the Joseph's Coat technique for yesterday's Blog Hop that I thought I'd take it a bit further. I don't know if there's a name for this or even it it's actually a "thing" (well, if not, I guess it is now!) but I like to think of it as "Joseph's Coat for control freaks" (such as I)! Ultimately, it's a type of emboss resist. I have also included here a short video tutorial. The centre panel started life as a piece of Whisper White cardstock. I rubbed it with my Embossing Buddy before I started - I think that step is quite important in order to control the embossing powder. Using the zig-zag stamp from Work of Art, I inked it well with Versamark and then tapped it into Tempting Turquoise ink before stamping onto one end of my white panel. I then immediately sprinked it with clear embossing powder. I then wiped my stamp clean with a damp cloth, dried it (with my hand!) and repeated the process at the other end of the panel. 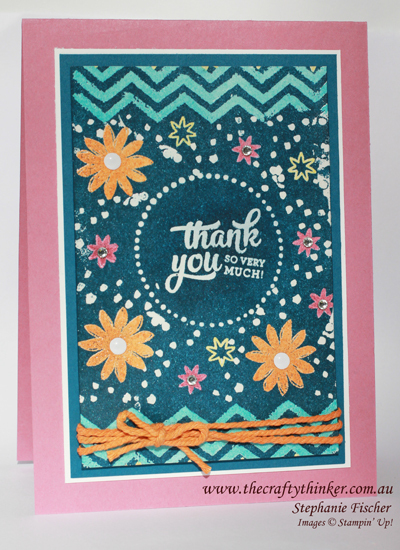 I then used the greeting from Mixed Borders but only used Versamark before sprinkling with the clear embosing powder. The next step was the circle of dots from Perfectly Wrapped, again just using Versamark and clear embossing powder. Then I used the large solid flower from Perfectly Wrapped, coated it with Versamark and then tapped it into Peakaboo Peach ink, stamped it on my panel and sprinkled with clear embossing powder. I reapeated this twice so that I had three Peakaboo Peach flowers. Using the small solid flower from Perfectly Wrapped, I used Versamark then Sweet Sugarplum before stamping and adding embossing powder. I stamped five of these. Next was the small flower (or star) outline from Perfectly Wrapped, for which I used Versamark and Daffodil Delight ink before adding the embossing powder. 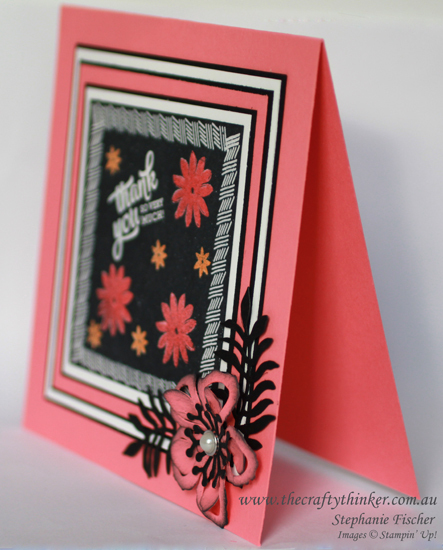 Lastly I used the dots from the No Bones About It stamp set with just Versamark before applying the embossing powder. After using the heat tool and allowing it to cool for a minute or two, I sponged with Dapper Denim ink and then used a tissue to wipe the ink from the heat embossing. I added White Perfect Accents to the centres of the Peakaboo Peak flowers and Rhinestones to the centres of the smaller flowers. I wrapped some Solid Bakers Twine around the bottom of the panel (it was Whisper White twine that I died Peakaboo Peach) and then finished the card layers. Main card: Sweet Sugarplum. Cut a 4.25" wide piece from an A4 sheet. Fold in half to produce a card that is 4.25" by just under 6" (5 7/8 to be exact!). Whisper White: 3 1/2" x 5 1/8"
Dapper Denim: 3 3/8" x 5"
Josheph's Coat panel: 3 1/8" x 4 3/4"